The final article covering the major Empires details the “King” to the “four princes”. CONCORD, short for CONsolidated COoperation and Relations commanD, was originally the brainchild of the Jove of all people. Devised as a way for the empires to maintain the peace, CONCORD was given broad authority over many interstellar affairs. CONCORD is charged with maintaining the status quo between the various empires. Perhaps the most useful tool in CONCORD’s possession in the pursuit of this mandate is Directive Alpha-Gamma 12, which allows CONCORD to seize any technology that could alter the strategic balance, and auction it off to the highest bidder in each of the other three empires (AG 12 strikes again, though not by name, in Templar One with the newly developed mercenary technology). 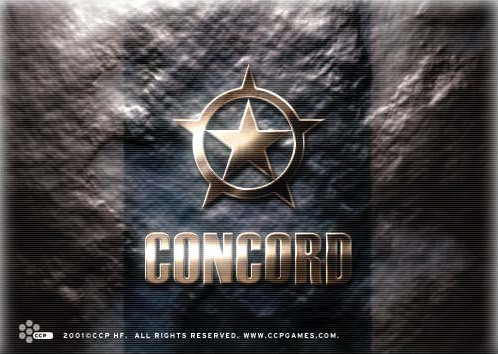 Originally formed in 23233, no one was originally sure what CONCORD would do with its new found powers. It took a while for it to get into its stride. Indeed, it wasn’t until 15 years later, when it negotiated the end of the Caldari-Gallente War, that anyone really took it seriously. From there, it slowly grew its base of support, and today it is self-sufficient from the taxes it earns from capsuleer transactions (those wonderful sales taxes we all must pay) and other revenue. Indeed, CONCORD no longer needs to rely at all on the empires for financial support, and it has used this newfound independence to advance its own agenda independent of the empires. CONCORD is headed by the Inner Circle, where each of the five New Eden nations sends a trustee to represent its own interests. The Inner Circle appears to hold significant sovereignty over the empires: after the YC 110 attacks, the various empires were unable to form capsuleer-controlled militias until CONCORD passed the Emergency Militia War Powers Act. From there, CONCORD breaks down into a number of divisions. The most well-known to the capsuleers would be the Directive Enforcement Division: they’re the ones who blow you up when committing a CONCORDable offense in space, acting as the policemen of the stars and protecting many a pilot in high security space. The other agency that us capsuleers have the most direct interaction with is the Secure Commerce Commission: they’re the ones that take your taxes and regulate trade between the empires. CONCORD’s secondary mission is to keep us rambunctious capsuleers in check. To that extent, the Jove have equipped CONCORD ships with specialized weaponry that prove far more deadly to capsuleer vessels than they do to regular vessels. Their specialized weaponry keeps pod pilots in check (at least theoretically), while also keeping CONCORD from growing too big for its britches, so to speak. I wonder whether there is any backstory explanation why CONCORD ships are so powerful. Is it because they were given ship designs by the Jovians? That's actually it precisely, Emergent. 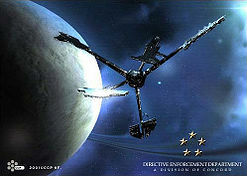 I didn't mention it in the Primer itself, but according to the recent ISD seminar on the storylines (transcript available here: http://wiki.eveonline.com/en/wiki/The_Storylines_of_New_Eden_-_11th_February), the Jove gave CONCORD specific weapons to counteract pod-piloted vessels. These weapons apparently don't work very well against non-pod ships, so beyond the pod pilot population, they aren't nearly as decisive. I wish I had a more formal citation to that information, but it's from a CCP source so I do consider the explanation officially canon. Someone had asked me to update the guide to reflect this a few weeks ago and I had just never gotten around to it. With this question, I'll try to add it to the guide in the next pass. Thanks for the question!